A unique Harley ride inner west Sydney was organised for Alistair. He is in Sydney on holidays from Scotland. 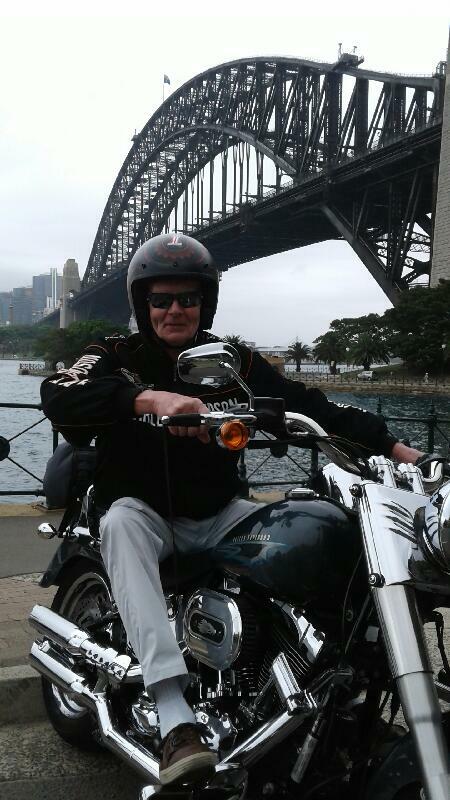 He wanted to go over the Sydney Harbour Bridge so someone on reception at his hotel suggested “why not do it on a Harley Davidson”. So the seed was planted! The concierge rang us and we organised Jungle to pick Alistair up. 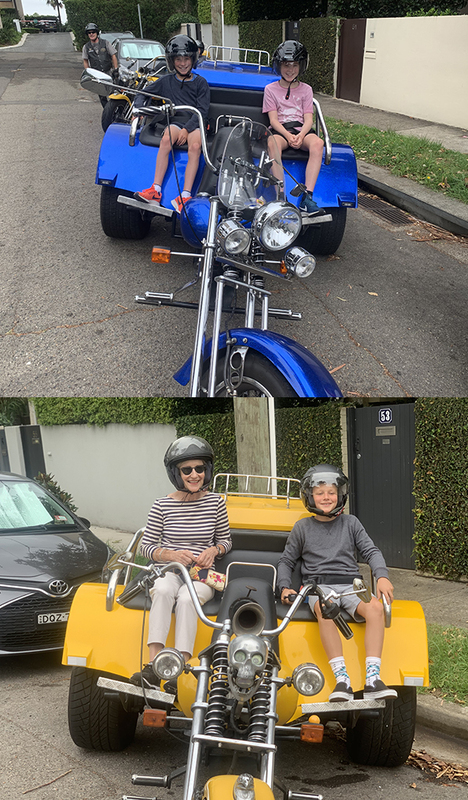 Alistair didn’t mind where they went after driving over the Harbour Bridge so Jungle took him on a Harley ride inner west Sydney. He saw many places most visitors to our beautiful city don’t get to see. 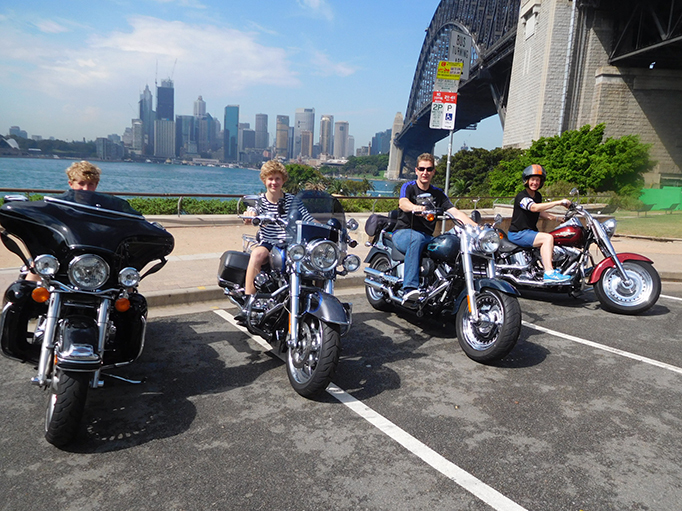 After riding over the bridge they stopped at Kirribilli for photos. They rode through some of the lower north shore suburbs to the Gladesville Bridge in the inner west. They continued on Victoria Road before they turned off and rode around Iron Cove Bay. This took them through Rodd Point and along Henley Marine Drive. It follows some of the 7km Bay Run. Next was an historical tour of Balmain. The historical Balmain Power Station, Dr Balmain’s original house and past the oldest bowling club in Australia. Then he was ridden back to his hotel to continue exploring Sydney on foot. If you’d like to do a Harley ride inner west Sydney and see something different to all the touristy parts, contact us for more information. The area now known as Balmain was part of a 550 acres (2.2 km2) grant to colonial surgeon Dr William Balmain (1762–1803) made in 1800 by Governor John Hunter. A year later, Balmain transferred his entire holding to settle a debt to John Borthwick Gilchrist before returning to Scotland. The legality of the land transfer from Balmain to Gilchrist for only 5 shillings was challenged by Balmain’s descendents and further development of the area was blocked.